Chia is edible seed of plant Salvia hispanica, a flowering plant found in Latin America. Latin America is considered as one of the main suppliers, as the region accounted for over 80% of global chia seeds supply in 2016. Chia seeds are preferred for massive amount of nutrients with very few calories. The seeds mainly consists of fibers, protein, fats, calcium, manganese, magnesium, and phosphorous with traces of zinc, vitamin B1, B2, B3 and potassium. The seeds improve metabolic health and reduce risk of heart diseases & type 2 diabetes. The seeds prevent premature skin aging, bone & muscle strength improvement and prevention of free radicals within body cells. Such health benefits are propelling demand for chia seeds in the food, beverage, personal care, and nutraceuticals industries. Moreover, increasing demand for chia seeds in dietary supplements & protein bars and natural food ingredients in food & beverage industry, preference of organic & gluten free vegan diet fuelled by growing awareness about chia seeds especially among professional athletes are some of the factors driving growth of the global chia seeds market. Moreover, preference of non-GMO chia seeds for cultivation is an immense opportunity for raw material suppliers and distributor to invest into chia seeds market. However, stringent regulations imposed on use of food & personal care ingredients by regional government authorities such as FDA, EFSA and less awareness about importance of chia seeds in developing economies are major challenges for growth of the chia seeds market. Among colors, black chia seeds segment generated highest revenue in global chia seeds market in 2016. The segment is projected to lead the market over the forecast period due to presence of higher amount of anti-oxidants as compared to white chia seeds. Europe is expected to show significant growth in global chia seeds market throughout the forecast period. In Europe, Germany and Netherlands are the most lucrative markets for chia seeds. According to Eurostat data, in 2016, Germany accounted for over 40% of total imports of chia seeds in Europe. Moreover, increasing popularity of chia seeds as a superfood due to its nutritional contents, is playing important role for market growth in Europe. According to Coherent Market Insights study, the global chia seeds market was valued at US$ 0.36 billion in 2016 and is expected to witness a CAGR of 34.48%, in terms of revenue, over the forecast period (2017 – 2025). Food & beverages segment held highest revenue share of 55.4% in the global chia seeds market, in 2016 and the segment is projected to maintain its dominance throughout the forecast period. In food & beverage industry, chia seeds are preferred in the preparation of breakfast cereals, protein bars, ready-to-eat meals, snacks, energy drinks, bakery and various other products. The major players in the global chia seeds market include Glanbia Nutritionals, Navitas Organics, Benexia, Nutiva Inc., Garden of Life, Mamma Chia, Salba Smart Natural Products and Spectrum Organics Products LLC among others. Key players are strategically investing in the chia seeds market, to enhance their product sales through smart business strategies. For instance, in April 2017, Benexia set up a new lipid research center in Belgium, Europe. The research center advise customers on the proper market positioning of chia seed ingredients in various applications for dietary supplements, food and beverages, including fats and oils, vegetable spreads, condiments, cooking oils, mayonnaise, dressings, and sports nutrition formulas. Chia seeds are gaining popularity as a ‘superfood – enriched in multiple nutrients’ due to presence of nutritional contents such as omega-3 fatty acids, fibers, anti-oxidants, minerals and various others. The global chia seeds market is gaining major traction due to its growing demand in various end-use industries such as food & beverages, nutraceuticals, personal care, animal feed, pharmaceuticals and cosmetics. The growth of global chia seeds market is mainly driven by growing demand for chia seeds due to its multiple health benefits. Among end-use industry, food & beverages segment, held highest revenue share in global chia seeds market in 2016. Owing to their increasing demand in the preparation of functional foods, bakery products, breakfast cereals and beverage base, the trend is projected to be continued over the forecast period. North America dominated in global chia seeds market in 2016 and the region is projected to maintain its dominance in the near future. 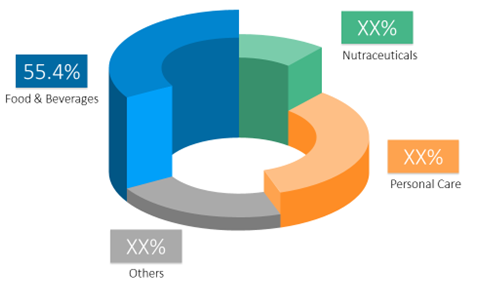 Increasing demand for chia enriched nutraceutical products, shifting consumer preference towards gluten-free diet, bulk availability of sources in the region are some key factors, which are driving growth of North America chia seeds market. Asia Pacific is projected to be the fastest growing market throughout the forecast period. Key companies covered as a part of this study includes Glanbia Nutritionals, Navitas Organics, Benexia, Nutiva Inc., Garden of Life, Mamma Chia, Salba Smart Natural Products and Spectrum Organics Products LLC among others. *Browse 150 market data tables and 60 figures on "Chia Seeds Market - Global forecast to 2025”.